-The recent slowdown of “stop and frisks,” which critics charged unfairly targeted minorities. 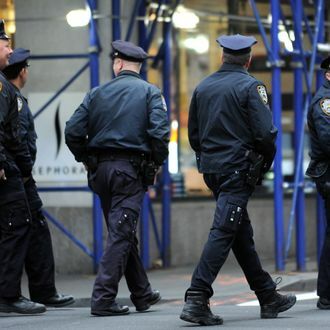 -Pressure from NYPD brass to stop downgrading reported crimes. -As crooks hunt for iPhones and iPads, they also swipe wallets containing credit cards, which has contributed to a rise in grand larcenies. -Fewer cops on the street. There’s no quantitative evidence provided in the article regarding any of the above, although Apple products are doubtlessly alluring to crooks considering their sheen. The “recent slowdown” of stop-and-frisks, though, has not been documented at all. In fact, through the first three months of 2012, the department conducted 203,500 searches, up from 183,326 last year, and putting the department on track to break the record set in 2011. While Bloomberg and Kelly have acknowledged that the system needs to be “mended,” they have not necessarily called for fewer stops, just valid ones. While that could result in a decrease eventually, it seems unlikely it’s already affected the crime rate. That leaves an uptick in paperwork. Downgrading crime stats has been a well-documented problem for the NYPD. “People complained cops don’t take reports,” a law enforcement source told the Post. “Cops don’t want to get in trouble, so they take a report on everything now.” So it’s entirely possible that the city isn’t more dangerous, but the dangers are just better documented.